Pour the 4 cups of water into the clay bowl, the 4 cinnamon sticks and some of the piloncillo and set over medium-high heat. Stir the water frequently so the piloncillo dissolves and don´t stick to the bowl. (try the water as you add some of the piloncillo so is not too sweet). When the water is boiling and the piloncillo is well dissolved, use a strainer to remove all the cinnamon residues and keep boiling for another 2 minutes now in low heat. Add the 4 tablespoons of the ground coffee and keep boiling for 5 more minutes with a lid on the bowl. Let the coffe settle and use the strainer one more time if necessary. 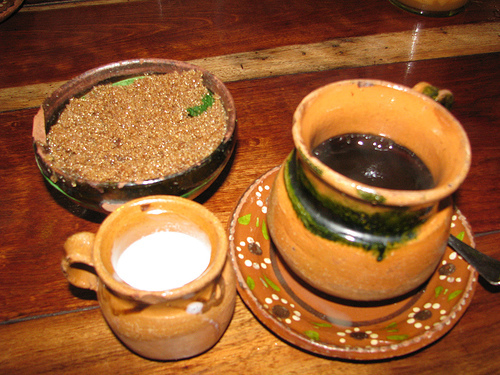 Serve hot on a clay cup and enjoy with sweet bread. This entry is filed under Coffee, Traditional Beverages. You can follow any responses to this entry through the RSS 2.0 feed. You can leave a response, or trackback from your own site.